Worlds Apart » Blog Archive » The Monster and the Maiden: Can You Hear Me Now? The Monster and the Maiden: Can You Hear Me Now? OMG!!!! I love your photostories… both sims and dolls! The tension between Tahlvin and Edmond was palpable… hilarious the "glares" they exchanged. Good to see nothing's changed there. And Edmond… *drools* I'm ruining my keyboard. What a perfect surprise! Glad to know you're still alive and doing well. Definitely worth the wait (as it always is). I'm astounded at how well the Saint head mould carries off Edmond's character – it's like it was made for him! But a lot of the credit must go to you, of course; the way he's been dressed and the way you've posed him is lovely, really well thought out. And of course the dynamics of the relationship between Tahlvin and Edmond were well put-across, I think; that awkwardness of meeting the parents, as it were. It's cool you're getting a Supia Rosy; a lot of them seem to be arriving after the latest ordering period, and I've seen a lot of really beautiful takes on the sculpt. Now I can't wait to see what you'll do with her to make your Emily! But I'm babbling now, heh. I loved this little photostory and how it tied into your Sims playing. Beautiful! Oh this was wonderful! I especially loved the two shots where Tahlvin was giving the phone back to Edmond. You could see Edmond's expression change in that shot! Absolutely perfect! They are both excellent embodiments of what I would imagine of the characters to be and I really am looking forward to Emily and Edmond together. Have you done Brandee yet? @Kiwi: heehee Yeah, Edmond and Tahlvin still don't get a long. I don't think that will ever change. Tahlvin is very protective of Emily and doesn't think any man is good enough for her…especially, Edmond! @amalinaball: I don't think any other sculpt could represent Edmond as well as the Saint. I'm glad you think so too! I'm also glad that you noticed his clothes. I was going for something similar to the outfit he wore when he first met Emily. heehee I thought it was funny too that there are naked pictures of Tahlvin on the wall…and in handcuffs no less! He claims to have no memory of it at all. Yes, I ordered my Supia Rosy during the special December Event when Supiadoll offered free shipping (I actually ordered her on the last day!). It was a pretty good deal. And, it only took a month and a half for her to get here. That's actually one of the faster turn around times I've had for a doll. The only doll that arrived sooner than that was Molly, my Pipos Ringo (she shipped out in only 2 weeks!). Oh, and if you ever want a translation of any French phrases or words, just ask. I'd be happy to provide them. @gayl: Thank you so much! It's fun to have an extension of my characters into a more tactile form. I'm still trying to figure out what doll I want to represent Brandee, which is one of the reasons she is conveniently on the other side of the Veil at the moment. wow wow I love this! You hit absolutely the right note with Tahlvin walking into the room in the middle of the conversation (returning you to 'fang face' haha!). 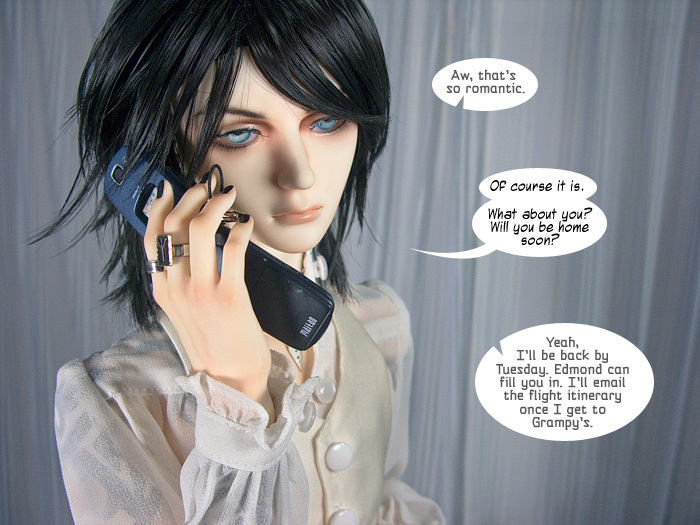 Although I know nothing about dolls, the resemblance to Edmond is amazing. Wondering which way the resemblance goes now. OW HAI need moar EdmondXEmily plz! When's she coming home? Man he makes my heart go aflutter, I can't wait till I have my Saint home too. I'm really interested to see him with Emily for a SaintXRosy pairing as they're both sculpts I adore. Tahlvin's an awesome dad too, you can tell how much he loves his little girl. @S.B. : Thank you! It's fun playing up Tahlvin and Edmond's rivalry. mwahahaha! As for Edmond: the Sim version came first and then I found a sculpt that thought would work for him. I don't try for a perfect match, since that would be almost impossible unless I had a head sculpted from one of my Sims' pictures (which actually is a possibility). I do try to find a sculpt that I feel conveys their personality though. @Hydrakitten: heehee Emily's home actually! She arrived early—the day after I took these pictures, in fact. Last night I took pictures of Emily and Edmond together. OMG! They look perfect! I was squee-ing. When is your Saint arriving? What body did you get for him? He'll be an awesome addition to your harem of gorgeous guys. Oh, and I've emailed you about the posters. Sriously, I had to totally set my schedule around this update . I've been dying to read it! And I finally did . Thanks again, for gracing us with your brilliance ! @Stephanie: Mr. Throw-up Face? Uh, oh. I hope it wasn't that bad. I'm honored that you blocked out time to read it though. Thank you! @Eris: I'm so sorry you were in an accident, but I'm very glad you weren't hurt. And, mono doesn't sound like fun. Take care of yourself and I hope you're feeling better soon. I'm so happy that my stories were able to provide you a little respite however. Thank you so much! Oh, no, no, no. It wasn't bad at all. It was freaking spectacular. I just used the sicky face to emphasis the 'die' thing. No way, man. You're awesome. I seem to be doing that alot lately. OMG! You're back! I'd missed your creative babies dropping by every couple weeks! 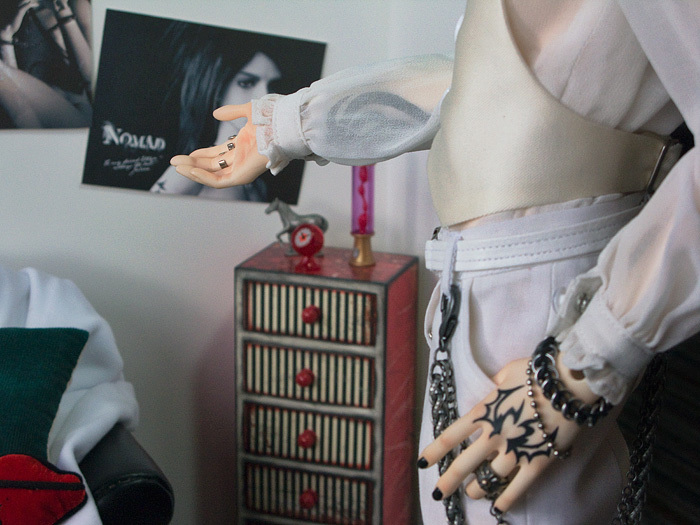 You're bjd photos never cease to amaze me Kara – you're dolls are somewhat personified its just… amazing! and i love how these dolls really capture the essence of your fantasy characters esp. the edmond doll. Wow! I'm just too happy – YOU'RE BACK! @Stephanie: Oh, that's okay, don't worry about it. The rest of your comment seemed very positive. I just associate the with barfing. haha! @Cadie: Thank you! It's great to have another outlet for my characters. Having them in doll form really makes them feel a bit more immediate too. When I saw Edmond's outfit, first thing that came to my mind was the Aikea Guinea outfit. You did a great job coordinating the sim and doll wardrobe. And I'm always amazed by all the cute tiny accessories for your dolls. It's nice to see Edmond and Tahlvin again! @Dektora: I'm so addicted to finding little accessories and props for my dolls now, even though it's really challenging to find things in the right scale. heehee I thought you'd appreciate Emily being in Bordeaux. She had a fun time there. I think the reason the guys don't get along is that there is too much hunkiness in one room. @Auntie: Thank you, Aunt Cher! I really enjoy his character, so it's fun to have him in another incarnation. Love you too!